A class of exegetes of the school of Mendelssohn. Not content with giving a simple meaning, most of the Biblical commentators immediately preceding Mendelssohn had interpreted the Biblical passages from an individual point of view, and had so distorted the literal sense of the words that they failed completely to make clear the actual meaning. Mendelssohn compiled for his children a literal German translation of the Pentateuch; and to this Solomon Dubno, a grammarian and excellent Hebraist, undertook to write a "biur" or commentary. As soon, however, as a portion of the translation was published, it was criticized by rabbis of the old school, including Raphael ha-Kohen of Hamburg, Ezekiel Landau of Prague, Hirsch Janow of Posen, and Phineas Levi Horwitz of Frankfort-on-the-Main. Fearing that the charm of the German language would lead the Jewish youth to study the translation rather than the Torah itself, and believing that they would thus be led away from orthodox Judaism, the rabbis united forces, and in June, 1779, issued a ban against "the German Pentateuch of Moses of Dessau." This act led Solomon Dubno to give up his work after having finished Genesis; but, in order that the undertaking might be completed, Mendelssohn himself undertook the commentary. Finding, however, that the work was beyond his strength, he committed to Naphtali Herz Wesel (Hartwig Wessely) the biur to Leviticus, to Aaron Jaroslav that to Numbers, and to Hertz Homberg that to twenty-two of the middle chapters of Deuteronomy. Ben Ze'eb Minor Prophets and introduction to the prophetical books. 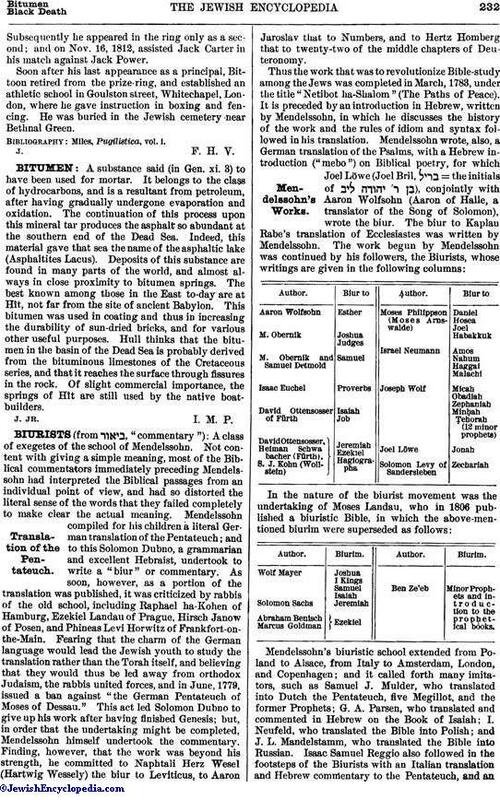 Mendelssohn's biuristic school extended from Poland to Alsace, from Italy to Amsterdam, London, and Copenhagen; and it called forth many imitators, such as Samuel J. Mulder, who translated into Dutch the Pentateuch, five Megillot, and the former Prophets; G. A. Parsen, who translated and commented in Hebrew on the Book of Isaiah; I. Neufeld, who translated the Bible into Polish; and J. L. Mandelstamm, who translated the Bible into Russian. Isaac Samuel Reggio also followed in the footsteps of the Biurists with an Italian translation and Hebrew commentary to the Pentateuch, and anItalian translation of Isaiah; Samuel David Luzzatto translated the Bible into Italian, and wrote biurim to Job, Isaiah, and the Pentateuch, and some glosses to Jeremiah, Ezekiel, Proverbs, and Job; and M. Rosenthal, J. Mannheimer, and M. Stern translated the Psalms into Hungarian. The movement later crossed the Atlantic, and Isaac Leeser of Philadelphia translated the Bible into English according to the interpretations of the Biurists; while in Europe steps were taken toward the perpetuation of the movement, in the foundation of the Ḥebra Doreshe Leshon 'Eber (Society of Investigators of the Hebrew Language) by Isaac Abraham Euchel and Mendel Breslau, and in the establishment of the periodical "Ha-Meassef" (The Gleaner). 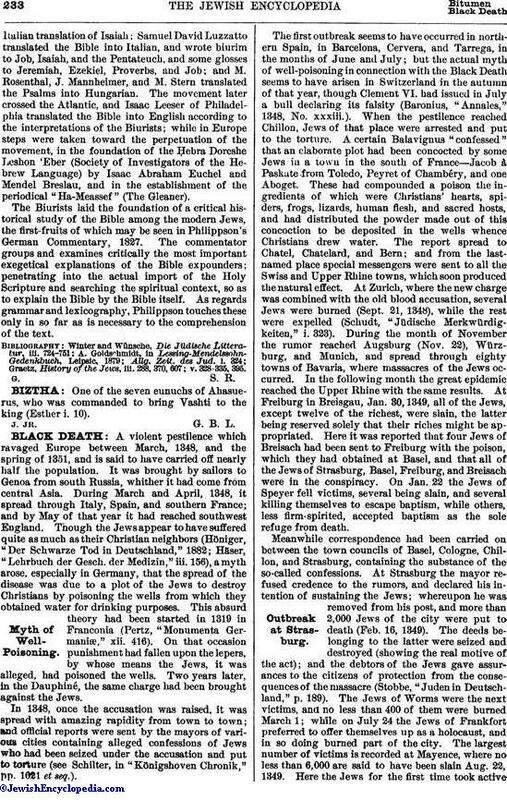 The Biurists laid the foundation of a critical historical study of the Bible among the modern Jews, the first-fruits of which may be seen in Philippson's German Commentary, 1827. The commentator groups and examines critically the most important exegetical explanations of the Bible expounders; penetrating into the actual import of the Holy Scripture and searching the spiritual context, so as to explain the Bible by the Bible itself. As regards grammar and lexicography, Philippson touches these only in so far as is necessary to the comprehension of the text. Graetz, History of the Jews, iii. 288, 370, 607; v. 328-335, 395.